Extra-capacity file tote with lid offers a great way to add stackable, accessible storage space or protect files in transit. Smart cover design makes stacking simple and closes securely. 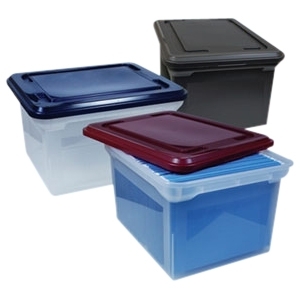 Navy lid opens from either side for easy access or can be removed for full access. Base is clear for easy viewing of contents. Use the built-in, molded-in handles for easy transport. File tote holds letter-size hanging documents.